With such a wide variety of companies and programs to examine, I would like to offer my observations on six areas of failure that repeatedly manifest within customer acquisition programs. The first failure point that can derail a sales & marketing program is who you are targeting. While this may seem like a fundamental and easy aspect of an outreach or lead generation program, you would be surprised how many companies struggle to identify and quantify their most relevant buying demographics. It’s uncommon, oddly enough, for business leadership to come into a conversation with prepared buyer personas. 1. Who has a pain that my product or service provides a solution for? Why? Prospects only buy when they are in pain (thanks, Sandler). The reality of any transaction is that it revolves around some pain, whether it’s emotional, physical, or professional. Are the potential customers you’re engaging really looking for your offering? 2. Of the people who need your offering, how many even exist? While some companies do figure out their customer demographics, there are very few cases where they’ve added a layer of quantification to their sales programs. If you’re going to identify how much you need to invest into different customer acquisition channels or overall sales efforts, you need to know how valuable - or dispensable - a single prospect is. Getting really granular and putting up strong estimates of your total addressable market will inform both overall sales strategy and the selling tactics you will employ. 3. Are these prospects actively looking for my solution? Startups, listen up! If no one is actively looking for your product, there is no way to really project market absorption. You’re going to have to educate your prospects and create pain before encountering demand. Before diabetes was first diagnosed and treatments were discovered, there were no patients, or even doctors, demanding insulin. Once people learned that insulin was the key to treating the disease and its associated symptoms, diabetics and physicians now had a reason to seek it out. The pain was identified and the patients were informed. Although startups almost always encounter this problem, middle market firms can suffer from this challenge, as well. If the market is highly commoditized and buyers are approached frequently from multiple vendors, “seeking out” a solution is not necessary. The next key failure point is messaging. And I’m not just talking about the quality and persuasive power of those messages. Frequently, distribution pathways are vastly underutilized, or just plain wrong for the audience. First, look at what you are saying and how you say it. The American consumer, as Alan Mulally famously said, wants everything and they don’t want to pay for it. This is true of their time, their attention, and their money. Modern customers, whether in business or personal engagements, are overwhelmed with marketing messages promoting a wide variety of products or services. With the rise of digital channels and social media, coupled with the sophistication of modern marketing technology, consumers are literally being bombarded by people trying to sell something. Your messaging absolutely must use the scant seconds it has to make an impression - by putting pressure on the prospect’s pain point. Either you get through, or you die. Brevity is better. No one will read paragraphs of features and benefits. Get to the point quickly and clearly. Be a human. Be approachable. Be humble. No one cares about your company, so stop telling them about it. ...They care about themselves. All prospects are narcissists, so talk to their pain and how your solution benefits them. Prospects are also risk-averse; saying you’re a startup or early stage business blatantly tells them that you pose a risk. Remember how nine out of ten startups fail? Don’t brag about Andreessen putting money into your company; no one cares. Make it easy! Your goal is to make meeting with you easy and painless. Don’t burden your prospects in any way. If you say something, but no one listens, did you ever say anything at all? Drop any ego about your product, your company, or your background. No one cares. Become obsessed with servicing your prospects’ pain, instead. That is the only thing that is important because it is what gets you meetings. Your channel mix should be measured constantly by the cost per lead and cost per qualified opportunity. Sales and marketing is about the distribution of capital with the intent of generating the highest return on deployed capital. Don’t underestimate the power of paying attention. Measure everything. In my journey to fully understand the modern sales process and why organizations fail to focus on what actually matters, this is the most interesting failure point for me. If we fully respect our prospects, then we ascribe tremendous value to their time. If you are able to generate a qualification meeting or call by successfully distributing your message to your intended buying demographic, then this is a step that must be respected. Many middle market firms struggle with grasping how important these meetings are for their sales program. Demonstrate and promote the value of your solution quickly and effectively enough to lead to the next step? Convey how your solution benefits the prospect and people like them, in response to their specific pain? If you can accomplish these things, you will get the decision maker or decision making unit to commit to a full demonstration or consultation of your offering. Whether your qualification event involves an influencer rather than a decision maker should not matter. 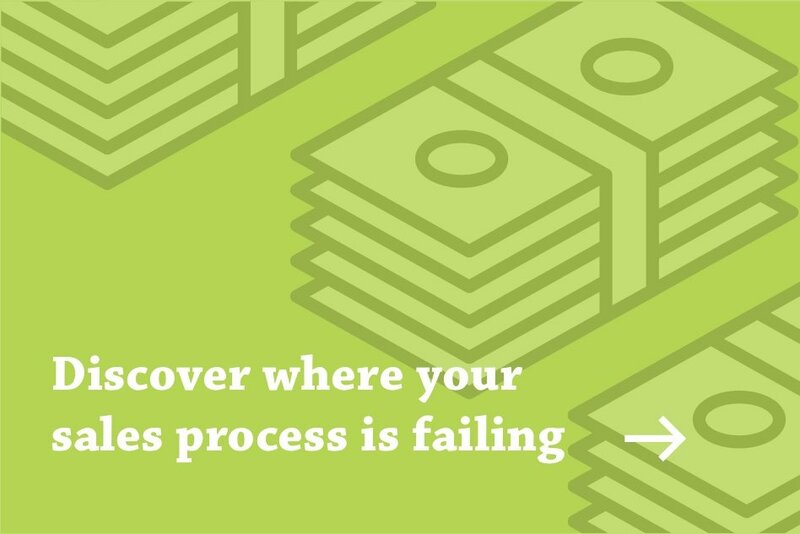 Your process should allow sales reps to identify the pain points within the account, then deliver an appropriate response to that pain that shows the value for the prospect. If the case is strong enough, that initial point of contact will distribute the solution internally and help bring the people who matter onto the demo or consultation. The point of contention I usually encounter is that the salespeople are “not talking to the right people.” But in those same companies, the sales teams are encountering lots of qualifying events... they just don’t materialize into demonstrations or consultations. This is a big, bright red flag indicating that the process likely needs work more than anything else. Is our messaging sufficiently informing our prospects? During initial conversations, are we selling, or solving? Do we need to further validate our product/market fit? Finding the qualifying events is the job of lower stage sales asset such as an SDR, BDR, or any inside sales position. Your sales process should not rely on exceptional “closers” that are true artists because that is not scalable. Fulfilling the efforts in your sales process should be like a paint by numbers exercise, where any college-educated person with some grit and communications skills can successfully close deals. This failure point is the easiest to identify because you are present and aware of what happens when you show the prospect your product or solution. If your product is not that compelling, doesn’t remedy the prospect's pain points, or is cumbersome and awkward, they are not going to ask for a proposal or consider buying it. If you are having less than a 20% conversion rate at this step, you need to get back into the lab and work on your product. Plain and simple. If you haven’t experienced failure at this point, you’re in good shape, but you still need to move your deal across the goal line. You have conveyed enough value for your product or service that your prospects are asking for a proposal to evaluate the finer details of your offering. The first significant failure of many sales programs that we see is that these interested prospects are not fully BANT (Budget, Authority, Need, Timeline) qualified prior to submitting a proposal. Industry averages tell us you should win at least 25% of all proposals that you submit. If that’s not the case, it is very likely your qualification process is incomplete. I encourage companies to strive for a 33% close rate or better. Proposal: The failure point in the proposal itself usually falls within the key business terms and structure of the agreement. Anything from payment terms, termination, limitation of liability, indemnification, enforceability, and term can derail your prospects ability to move forward and execute the deal. Pricing: Remember, in the absence of all other important factors, there is only price. If you are losing deals based on your pricing, there is a binary reason for it: either you are not actually qualifying and solving your prospect's pain points, or you are pricing yourself out of the market. Price is really important if you are competing in a saturated space that views your product as a commodity. Ensuring you are communicating and validating your key value to the customer is critically important. Product: This is the failure that stings the most. If you are getting constantly bested by a particular competitor or group of competitors based on features of the product or service itself, you must get back into the lab and address this. Don’t blame your salespeople if you are converting less than 20% of BANT qualified opportunities. No one likes hearing their baby is ugly, but if you're converting below that 20% benchmark and doing everything else right, have a self-effacing moment and deal with the problem. Luckily, uncovering each or any of these failures means you’re closer to operating more effectively, since every failure reveals an opportunity. You just need to know how to fix it. At FullFunnel, that’s our purpose. To find the dead weight, cut it from the process, and replace it with something sustainable, realistically manageable, and successful. To learn more about how our team can help you achieve the results you desire without the costs you dread, click here to request a consultation. We begin every engagement by assigning you a senior partner who leads a deep discovery process to pinpoint your failures, bring them to light, and advise you how to correct them. Get started today.